Story: VOLVER is a meeting of "Mildred Pierce" and "Arsenic and Old Lace", combined with the surrealistic naturalism of my fourth film, "What Have I Done to Deserve This? ", that is, Madrid and its lively working-class neighbourhoods, where the immigrants from the various Spanish provinces share dreams, lives and fortune with a multitude of ethnic groups and other races. At the heart of this social framework, three generations of women survive wind, fire and even death, thanks to goodness, audacity and a limitless vitality. They are Raimunda (Penelope Cruz), who is married to an unemployed labourer and has a teenage daughter (Yohana Cobo); Sole (Lola Duenas), her sister, who makes a living as a hairdresser; and the mother of both (Carmen Maura), who died in a fire along with her husband. This character appears first to her sister (Chus Lampreave) and then to Sole, although the people with whom she has some unresolved matters are Raimunda and her neighbour in the village, Agustina (Blanca Portillo). 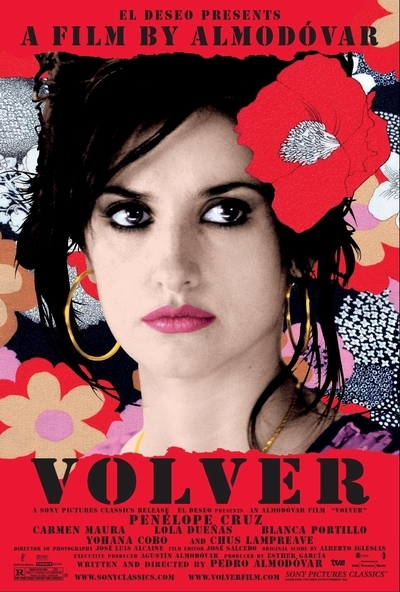 VOLVER is not a surrealistic comedy although it may seem so at times. The living and the dead coexist without any discord, causing situations that are either hilarious or filled with a deep, genuine emotion. It's a film about the culture of death in my native La Mancha. The people there practice it with an admirable naturalness. The way in which the dead continue to be present in their lives, the richness and humanity of their rites mean that the dead never die. VOLVER destroys all the cliches about "black" Spain and offers a Spain that is as real as it is the opposite. A Spain that is white, spontaneous, funny, intrepid, supportive and fair.